William Jeakle was born March 31, 1920. He is credited with three enemy aircraft shot down. First victory was claimed on October 15, 1943. Second on November 16, 1943. His third claim was on December 16, 1943 for a 'zero' over Arawe. After completing his tour of duty and 160 combat missions, Jeakle returned to the United States in September 1944. Jeakle passed away October 20, 2004. Built by Lockheed Aircraft Corporation (LAC) in Burbank, California. Constructors Number 1367. Delivered to the U. S. Army. Disassembled and shipped overseas and reassembled. Assigned to the 5th Air Force, 475th Fighter Group, 433rd Fighter Squadron. Nicknamed "Regina Coeli" (Latin for "Queen of Heaven"). Nose Number 179. The spinners were painted in the blue outlined in white at the rear and olive drab at the tip. Normally assigned to pilot Joe McKeon. 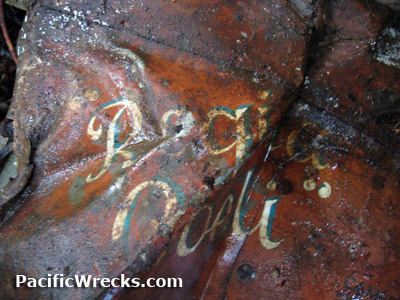 This aircraft was damaged during combat near Rabaul on November 2, 1943. 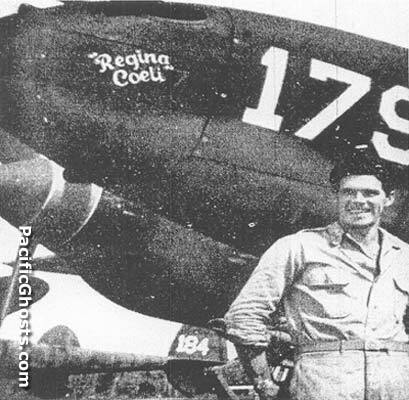 Joe McKeon claimed 4 kills (two in the Regina Coeli on September 22, 1943) and had McKeon's for kills painted on the nose. On December 18, 1943 Jeakle suffered a slight taxing mishap prior to take off in his own P-38, and switched mounts to pilot this P-38 instead. Took off from North Borio Airfield (Dobodura No. 15) near Dobodura on a fighter sweep over Arawe. Over the target, Jeakle spotted an enemy fighter an prepared to attack, but another P-38 piloted by Lt. Neely collided with him in a mid-air collision. Jeakle was last seen spiraling at 9,000 feet, 15 miles north of Arawe near the Pulie River. No parachute had been seen to blossom from the tailless P-38. Lt. Neely, who collided with his P-38 made a safe landing at Dobodura despite a damaged wing and propeller and was treated for shock. He later went MIA on April 16, 1944 "Black Sunday" piloting P-38J 42-104385. "My worst day was December the 18th 1943. About this time i peeled right off behind a Zero. Got him... he was going to be deader than hell. I looked back to see if my guys are with me. Yeah, the boys were still behind me. Yeah, Pete is back there, the boys are back there. I look to the side, and 'oh my god' there is a P-38 staring me right in the face - right there. Staring me right in the face. And I shoved everything forward and just dumped everything. And I was hit. It felt like a Mac Truck. As soon as I was hit, I lost all control. Broke.. what he did, the wing of his plane cut through the right boom, and cut everything off, all my controls. I had no pedals, nothing at all. So the next thing I said was 'get outta that thing. I pulled the canopy, tripped the canopy. Which pulls pins back here to release the canopy, and it went back alright." One of the few flying boats then on rescue service picked up Jeakle and took him back to safety. Lt. Jeakle returned to the Squadron camp on December 28, 1943. “Nobody was happier that the distraught Neely to see Jeakle back after 11 days in the jungle”. He returned to duty on January 6, 1944. Lt. Neely made a safe landing at Dobodura despite a damaged wing and propeller and was treated for shock. He later went MIA on April 16, 1944 "Black Sunday" flying P-38J 42-104385. Jeakle hid in the jungle and evaded captured, making his way to the coast and spotted by a PBY Catalina that he signaled and landed to rescue him. 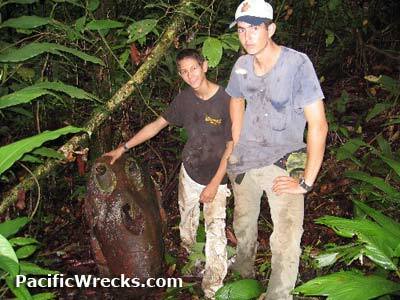 On April 21, 2007 the wreckage of this P-38 was located by Mark Reichman and his family. "With the help of 5 nationals, my son, daughter and I came across a P-38 in the bush of West New Britain up the Pulie river. The nose cone on the right side had the name: 'Regina Coeli'. Inside the right wheel well there is a Lockheed emblem with serial number: 2412 065 Assem No: 230100-500R The engines are intact with cowlings so we unable to get engine serial numbers. What we could see of the engines they are in good nick with some paint looking like new. The fuselage is totally destroyed although one foot pedal and throttle control is laying around. Some gauge faces. The five guns are there. We did not notice the fuselage area directly in back of the nose cone as it may have been all mangled." "I just minutes ago learned that you found my grandfathers plane. We are very excited about this news. Its particularly poignant as we are still grieving his loss even though he has been gone 2.5 years now in 2004. My grandfather did extensive interviews that are on DVD, including one for the History Channel. At the time of his death he was living in Muncie, IN and had lived there for about 30 years. For the bulk of his life following the war he worked as an automotive engineer and was closely involved in the development of important technology such as the limited-slip differential. He had two children and 4 grandchildren. He lived to see two of his 4 great-grandchildren. In his 60s he became active in the 475th Fighter Group." Thanks to Suzanne Jeakle, John Stanaway, John Douglas and Mark Reichman for additional information.